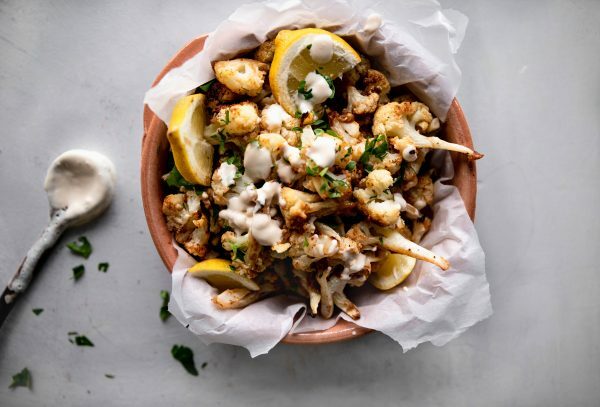 Tangy baked cauliflower with tangy lemon and tahini sauce. There are days I can’t remember where I put my keys or what I ate for breakfast. Is it the 3 kids that made me lose my memory or just getting older? I’m not sure but I do know that there are some memories that are hard to forget. Like Sunday meals with the family growing up. Sundays were one of the only days my dad didn’t open the shop. It was also the day where we had a big meal, often chicken and toum, grape leaves and side dishes of hummus and baba ganoush. Not too long ago, I remembered a dish my mom used to make, fried cauliflower. Fried bites of cauliflower with tangy, delicious tarator sauce. But let’s be honest, I don’t like frying much. So I thought recreating this well loved recipe by roasting the cauliflower, resulting in a delicious side dish or appetizer perfect for Sunday supper or an appetizer or side dish at your holiday gathering. Arnabeet Mekleh (translated to fried cauliflower) is a common Lebanese snack. 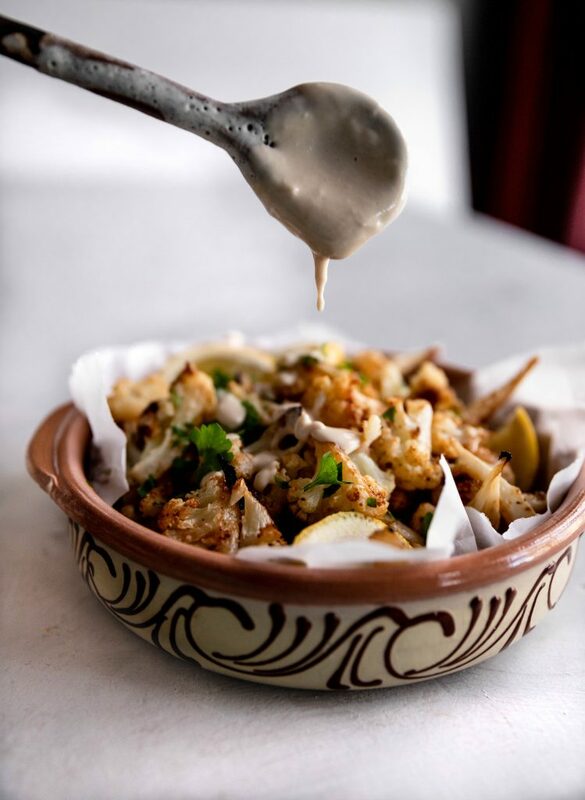 Cauliflower florets dredged and fried into morsels of goodness, drizzled with the classic tarator sauce (tahini garlic sauce). Don’t get me wrong, I LOVE these bites, they are everything you dream of. But I do NOT like frying, especially savory foods. I’ll fry a donut any day of the week, but savory foods tend to evoke more of a smell when frying. And let’s be honest, anything baked is 10x healthier for you. Do you prefer baked foods versus fried? 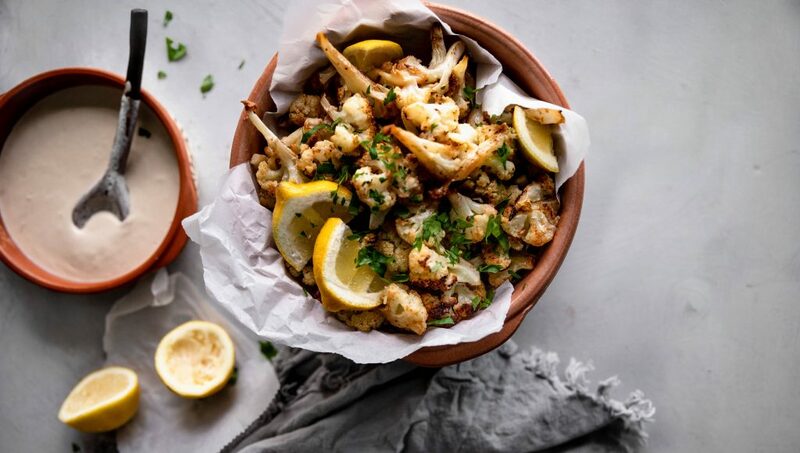 Truth be told, my kids aren’t cauliflower fans, until they tried these delicious bites. Roasted to perfection with a healthy coating of toum to really caramelize and glaze the bites, tangy lemon squeezed on top and garlicky tarator to dip. These simple ingredients truly transform the simple, humble cauliflower to the perfect snack. 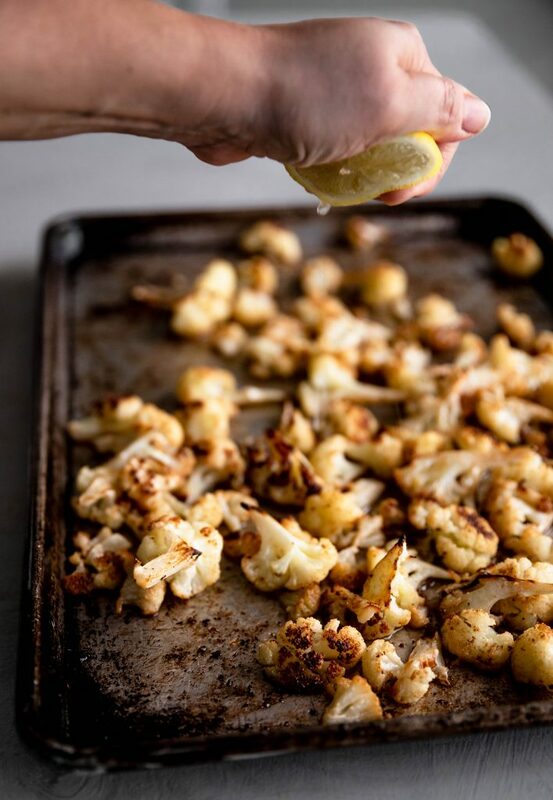 A squeeze of lemon on the hot charred cauliflower. Classic taratore sauce (tahini, garlic and lemon) take these from ordinary to extraordinary. Cauliflower has been the CRAZE lately, cauliflower rice, cauliflower pizza (which I beg to disagree on). Truth is, cauliflower is a superfood that we all should be eating more of. It’s an excellent source of fiber, high in Vitamin C and an anti-inflammatory. I always appreciate new ways of enjoying vegetables, with this dish being both vegan and gluten free, it’s a winner for anyone looking for a delicious, nutritious dish. As always, I hope you enjoy this dish and love seeing your creations. Tag me on Instagram @CosettesKitchen or post on my Facebook Page. Enjoy as an appetizer or side dish for any meal. 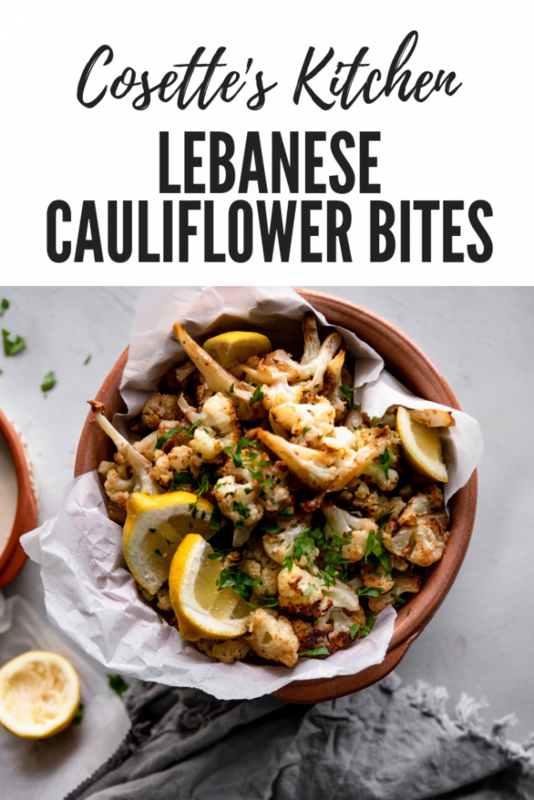 Lebanese Cauliflower Bites, Pin for later. Prepare cauliflower by cutting into florets. Spread florets on baking sheet and coat with toum and salt, be sure each floret is coated. Bake for 20-25 minutes tossing halfway to ensure all pieces are browning evenly. Once browned and caramelized, remove from oven and squeeze liberally with lemon. Plate and enjoy with taratore sauce. With mortar and pestle smash garlic, add your tahini, water, lemon and salt. Adjust lemon and salt to your liking. Add additional water or lemon juice to thin if too thick. Hope that helps! Message me with any questions you have.